What is the cause of mono? What are the risk factors for mono? How is mono transmitted or spread? What is the incubation period for mono? What is the contagious period for mono? What are the signs of mono? What tests do health care professionals use to diagnose infectious mono? What health care specialists treat infectious mono? What is the usual course and treatment of mono? What are the complications of mono? What is the prognosis of mono? Is it possible to prevent mono? Take the Quiz - Is it Contagious? Infectious mononucleosis (mono) is a contagious illness typically caused by the Epstein-Barr virus (EBV). This infectious disease can be spread by saliva, and the incubation period for mono is four to eight weeks. Using contaminated items, such as drinking glasses or toothbrushes, can spread the infection. Most adults have laboratory evidence (antibodies against the Epstein-Barr virus) indicative of a previous infection with EBV and are immune to further infection. swollen lymph nodes (known as lymphadenopathy). The diagnosis of mono is confirmed by blood tests. Mono can cause liver inflammation (hepatitis) and enlargement of the spleen. Vigorous contact sports should be avoided during the illness and recovery phase to prevent rupture of the spleen. The long-term prognosis for most people with mono is excellent, and severe complications are rare. Sore Throat: Is It Mono? Having a sore throat can be a symptom of many conditions, and many people wonder if their own sore throat might be a sign of something more serious than the common cold. Specifically, infectious mononucleosis ("mono") and infection with Streptococcus bacteria ("strep throat") are two conditions that both produce an extremely painful sore throat. Infectious mononucleosis, "mono," "kissing disease," and glandular fever are all terms popularly used for the very common infection typically caused by the Epstein-Barr virus (EBV), but other viruses can also cause the disease. This article focuses specifically on the Epstein-Barr virus as a cause of mono since this is the characteristic virus associated with the condition. The symptoms of Epstein-Barr virus infection include fever, fatigue, malaise, and sore throat. 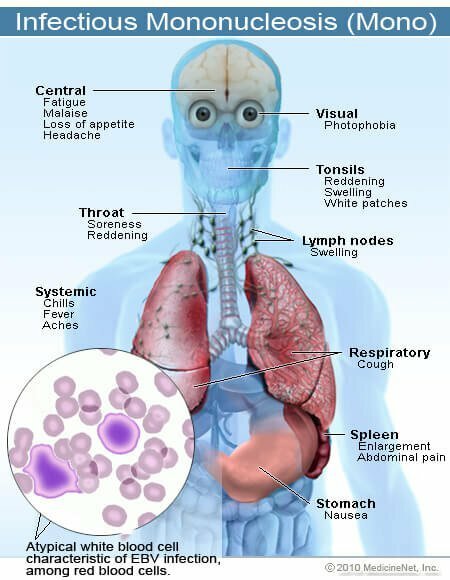 The designation "mononucleosis" refers to an increase in a particular type of mononuclear white blood cells (lymphocytes) in the bloodstream relative to the other white blood cells as a result of the viral infection. Scientifically, EBV is classified as a member of the herpesvirus family. The disease was first described in 1889 and was referred to as "Drüsenfieber," or glandular fever. The term infectious mononucleosis was first used in 1920 when an increased number of lymphocytes were found in the blood of a group of college students who had fever and symptoms of the condition. fever, which may be persistent. It is typically the severe sore throat that prompts people to contact their doctor. The EBV that causes mono is found throughout the world. By the time most people reach adulthood, antibodies against EBV can be detected in their blood. In the U.S., up to 95% of adults 35-40 years of age have antibodies directed against EBV. This means that most people, sometime in their lives, have been infected with EBV. The body's immune system produces antibodies to attack and help destroy invading viruses and bacteria. These specific EBV antibodies can be detected in the blood of people who have been infected with mono. When infection occurs in childhood, the virus most often produces no symptoms. It is estimated that only about 10% of children who become infected with EBV develop the illness. Likewise, probably because of immunity from prior infection, adults typically do not develop the illness. Most cases of infectious mononucleosis occur in the 15-24 age group. While there are other illnesses falling under the broad classification of mononucleosis that can cause similar symptoms (cytomegalovirus [CMV] infection is one example) and an increase in blood lymphocytes, the mononucleosis caused by the EBV is by far the most common. The EBV can infect anyone. As previously discussed, the majority of people have become infected with the virus by the time that they reach adulthood, and the majority of these infections produce no symptoms and are not recognized as mono. Mono is most often diagnosed in adolescents and young adults, with a peak incidence at 15-17 years of age. However, it can also be seen in children. Generally, the illness is less severe in young children and may mimic the symptoms of other common childhood illnesses, which may explain why it is less commonly diagnosed or recognized in this younger age group. Mono is spread by person-to-person contact. Saliva is the primary method of transmitting mono, which leads to the infection of B lymphocytes in the mouth and throat. Infectious mononucleosis developed its common name of "kissing disease" from this prevalent form of transmission among teenagers. It typically takes between four to eight weeks for people become symptomatic after the initial Epstein-Barr virus infection. A person with mono can also pass the disease by coughing or sneezing, causing small droplets of infected saliva and/or mucus to be suspended in the air which can be inhaled by others. Sharing food or beverages from the same container or utensil can also transfer the virus from one person to another since contact with infected saliva may result. Most people have been exposed to the virus as children, and as a result of the exposure, they have developed immunity to the virus. It is of note that most people who are exposed to the EBV don't ever develop mononucleosis. The incubation period for mono, meaning the time from the initial viral infection until the appearance of clinical symptoms, is between four and eight weeks. During an infection, the contagious period in which a person is likely able to transmit the virus to others lasts for at least a few weeks and possibly longer, even after symptoms have disappeared (see below). Research has shown that, depending on the method used to detect the virus, anywhere from 20%-80% of people who have had mononucleosis and have recovered will continue to secrete the EBV in their saliva for years due to periodic "reactivations" of the viral infection. Since healthy people without symptoms also secrete the virus during reactivation episodes throughout their lifetime, isolation of people infected with EBV is not necessary. It is currently believed that these healthy people, who nevertheless secrete EBV particles, are the primary reservoir for transmission of EBV among humans. Therefore, it can be difficult to precisely determine how long the infection may be contagious. swollen lymph nodes in the neck that typically occur on both sides. The tonsils have a whitish coating in at least one-third of the cases. The spleen (sometimes referred to as the body's biggest lymph node) is an organ found in the left upper abdomen underneath the rib cage, which becomes enlarged or swollen in about half of patients with mono. An enlarged liver and abnormalities in liver function tests (blood tests) may be detected (see Complications, below). 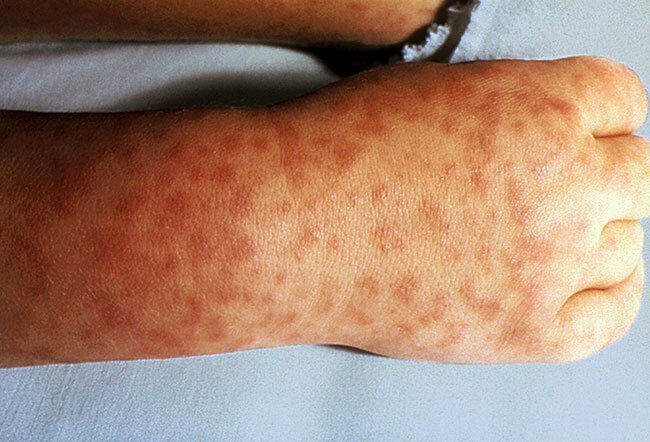 Some of patients have a splotchy red rash over the body, which has a similar appearance to the rash of measles. Early in the course of disease (over the first few days of illness), a temporary swelling (edema) of both upper eyelids may appear. The diagnosis of mono is suspected by the doctor based on the above symptoms and signs. Mono is confirmed by blood tests that may also include tests to exclude other possible causes of the symptoms, such as tests to rule out strep throat. Early in the course of the mono, blood tests may show an increase in one type of white blood cell (lymphocyte). Some of these increased lymphocytes have an unusual or appearance (known as atypical lymphocytes) when viewed under a microscope, which suggests mono. More specific blood tests, such as the monospot and heterophile antibody tests, can confirm the diagnosis of mono. These tests rely on the body's immune system to make measurable antibodies against the EBV. Unfortunately, the antibodies may not become detectable until the second or third weeks of the illness. A blood chemistry test may reveal inflammation and abnormalities in liver function. Diagnostic tests performed in the laboratory may be of value to rule out other causes of sore throat and fever, including cytomegalovirus infection, strep throat, and less common conditions such as acute HIV infection or toxoplasmosis. Infectious mono is often managed by primary care specialists, including pediatricians and family-medicine specialists. Internal medicine specialists also treat patients with mono. With complications or severe situations, other medical specialists including infectious-disease specialists, hematologists, cardiologists, gastroenterologists, or neurologists, may be consulted. With certain clinical complications such as rupture of the spleen, a surgeon will be involved in the patient's care. In most cases of mono, no specific medical treatment is necessary. The illness is usually self-limited and passes much the way other common viral illnesses resolve. Treatment is directed toward the relief of clinical symptoms and signs. Available antiviral drugs have no significant effect on the overall outcome of mono and may actually prolong the course of the illness. Occasionally, strep throat occurs in conjunction with mono and is best treated with penicillin or erythromycin (E-Mycin, Eryc, Ery-Tab, PCE, Pediazole, Ilosone). Ampicillin (Omnipen, Polycillin, Principen) and amoxicillin (Amoxil, DisperMox, Trimox) should be avoided if there is a possibility of mono since up to 90% of patients with mono develop a rash when taking these medications. If this happens, the individuals may then be inappropriately thought to have an allergy to penicillin. For the most part, supportive or comfort measures are all that is necessary. Antiviral medications have not been shown to be of benefit. Acetaminophen (Tylenol) or ibuprofen (Advil) can be given for fever and any headache or body aches. A sufficient amount of sleep and rest is important. The throat soreness is worst during the first five to seven days of illness and then subsides over the next seven to 10 days. The swollen, tender lymph nodes generally subside by the third week. A feeling of fatigue or tiredness may persist for months following the acute infection phase of the illness. It is recommended that patients with mono avoid participation in any contact sports for three to four weeks after the onset of symptoms to prevent trauma to the enlarged spleen. The enlarged spleen is susceptible to rupture, which can be life-threatening. Cortisone medication is occasionally given for the treatment of severely swollen tonsils or throat tissues that threaten to obstruct breathing. Patients can continue to have virus particles present in their saliva for as long as 18 months after the initial infection. When symptoms persist for more than six months, the condition is frequently called "chronic" EBV infection or "chronic mononucleosis." However, laboratory tests generally cannot confirm continued active EBV infection in people with chronic EBV symptoms. A common, but usually not serious, complication of mono is a mild inflammation of the liver, or hepatitis. This form of hepatitis is rarely serious or requires treatment. It generally resolves on its own as the condition improves. The enlargement of the spleen that occurs with mono makes traumatic rupture of the spleen a possible complication. Swelling of the throat and tonsils can also lead to airway obstruction when severe. Infection in the area of the tonsil can rarely become a serious abscess referred to as a peritonsillar abscess. Fortunately, the more severe complications of mono are quite rare, and mono is very rarely fatal in healthy people. The rare severe complications include destruction of red blood cells (hemolytic anemia) and inflammation of the sac surrounding the heart (pericarditis), the heart muscle itself (myocarditis), and the brain (encephalitis). Mono tends to be more aggressive in patients with abnormal immune systems, such as people with AIDS or those who are taking medications that suppress immune function. The EBV has been associated with some types of cancers, most commonly lymphomas. This occurs most frequently in people whose immune systems have been compromised due to disease or immune-suppressive drugs. EBV infection has also been found to be associated with two types of cancer is sometimes found in other cultures -- nasopharyngeal carcinoma (cancer of the pharynx and nose) in southern China and Burkitt's lymphoma of the jaw among children in equatorial Africa. Further, numerous studies have also found that EBV infection is associated with the development of at least one subtype of Hodgkin's disease. However, since the vast majority of people have been infected with EBV and never develop these types of tumors, EBV infection cannot be the sole cause of these cancers. The overwhelming majority of people who have had mono recover completely without any serious complications. Most people with mono recover completely with no long-term problems. The fatigue associated with the condition may persist for a few months after the fever and other symptoms have resolved. Severe complications as described above are very rare. Infectious mononucleosis is usually a self-limited, although sometimes prolonged, and often uncomfortable illness. While specific treatment is rarely necessary, the potential complications make it essential that people with this illness be under the care of a physician. Since mono is spread from person to person, avoiding close personal contact with infected individuals and practicing excellent hygienic practices can help prevent transmission of the virus. This includes avoiding sharing contaminated utensils like toothbrushes and drinking glasses. However, since periodic reactivations of the virus infection seem to occur in healthy individuals and because many infected people who may transmit the virus to others will not have symptoms of the condition, prevention is extremely difficult. In fact, these individuals without symptoms are believed to be the primary source of transmission of the virus. The fact that up to 95% of adults have antibodies to EBV suggests that prevention of the infection is difficult if not impossible. It is not known why some people develop the symptoms of mono while others appear to acquire the EBV infection without having symptoms. It is possible that many infections occur and produce mild symptoms and are not recognized as mono, while other infections may not produce symptoms at all. Cunha, Burke A. "Epstein-Barr Virus (EBV) Infectious Mononucleosis (Mono)." Medscape. July 11, 2017. <http://emedicine.medscape.com/article/222040-overview>. Macsween, K.F., C.D. Higgins, K.A. McAulay, H. Williams, N. Harrison, A.J. Swerdlow, and D.H. Crawford. "Infectious Mononucleosis in University Students in the United Kingdom: Evaluation of the Clinical Features and Consequences of the Disease." Clin Infect Dis 50.5 (2010): 699. United States. Centers for Disease Control and Prevention. "Epstein-Barr Virus and Infectious Mononucleosis." May 8, 2018. <https://www.cdc.gov/epstein-barr/index.html>. Is it contagious? Is bronchitis contagious? Is pneumonia contagious? Is shingles contagious? Are sinus infections contagious? Learn what kinds of diseases are communicable. Read more: Is It Contagious? What Diseases Are Contagious? For infectious mononucleosis (mono), what were the symptoms and signs you experienced? What was the treatment for your mononucleosis? Most cases of mononucleosis occur in the 15-24 age group. How did you or your child "catch" mono? Did your child have mononucleosis? Please share your family's experience. Tonsillitis is a contagious infection with symptoms of bad breath, snoring, congestion, headache, hoarseness, laryngitis, and coughing up blood. Tonsillitis can be caused acute infection of the tonsils, and several types of bacteria or viruses (for example, strep throat or mononucleosis). There are two types of tonsillitis, acute and chronic. Acute tonsillitis lasts from one to two weeks while chronic tonsillitis can last from months to years. Treatment of tonsillitis and adenoids include antibiotics, over-the-counter medications, and home remedies to relieve pain and inflammation, for example, salt water gargle, slippery elm throat lozenges, sipping warm beverages and eating frozen foods (ice cream, popsicles), serrapeptase, papain, and andrographism Some people with chronic tonsillitis may need surgery (tonsillectomy or adenoidectomy). A specific viral infection (with the Epstein-Barr virus) in which there is an increase of white blood cells that are mononuclear (with a single nucleus). See a picture of Infectious Mononucleosis and learn more about the health topic. What is mononucleosis (mono)? Learn about mononucleosis (mono) symptoms, treatment, and diagnosis. Discover how mononucleosis (mono) is caused by the Epstein Barr virus. Is mononucleosis (mono) contagious? An upper respiratory infection is a contagious infection of the structures of the upper respiratory tract, which includes the sinuses, nasal passages, pharynx, and larynx. Common causes of an upper respiratory infection include bacteria and viruses such as rhinoviruses, group A streptococci, influenza, respiratory syncytial, whooping cough, diphtheria, and Epstein-Barr. Examples of symptoms of upper respiratory infection include sneezing, sore throat, cough, fever, and nasal congestion. Treatment of upper respiratory infections are based upon the cause. Generally, viral infections are treated symptomatically with over-the-counter (OTC) medication and home remedies. Watch this slideshow on Viral Infections and learn about types, treatment, and prevention of illnesses caused by viruses.